Notes: Based on the manga by Inui Sekihiko, currently licensed in North America through Broccoli Books. On the run after a coup d'etat, Princess Alita stumbles upon bounty hunter Falis, and through circumstance and impending death, the two of them accidentally switch bodies. However, making the best of the situation, the (former) princess aquires the help of the bounty hunter to step in as the pricess of Forland in her stead and protect it from dangers, even that which is yet to be unveiled. When I first laid eyes on the title of this show, I wasn't sure what to think. It was only when I checked out the official homepage of the show itself that I decided to give it a look-see, mostly because curiosity eventually got the better of me. And, for once, that wasn't really a bad thing. 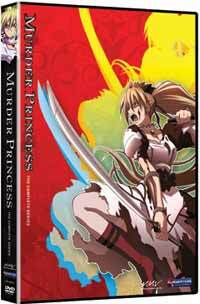 Murder Princess is, to put it short, a badass action adventure that doesn't aspire to be anything big, but definitely succeeds in entertaining. Being an OAV, the art and animation is, for the better part, definitely up to scratch. I was about to use the word "lovely" in its description, but seeing as it's rather violent for the most part -- and with a name like that, did you ever expect anything else -- that would not be very appropriate. Nevertheless, there are some rather nifty battle scenes, which is one of Murder Princess' biggest draws. The show is also seemingly going for a slight cartoonic feel to it, if the first of the villains is any indication, not to mention Alita's/Falis' partners; Dominikov and Pete -- a diminiutive but dangerous character with skeletal patterns on his clothes and wielding a scythe, and a huge, lumbering frankenstein's monster-like giant with massive fists -- respectively. Rounding up the sensory treats this show has to offer is the rock/metal-ish soundtrack, which permeates most of the music used in this show. It lends the whole thing a feel you'd otherwise see in Heavy Metal Magazine, which isn't necessarily a bad thing either. Sure, the music might come off as a wee bit generic. It's mostly riffs anyway, to accompany the more action-oriented parts of the show, but it sounds good enough for me not to dismiss it. I'm not saying the show doesn't have any problems. For one thing, the aforementioned cartoonish feel to it does occationally make Murder Princess shoot itself in the knee. That is to say, some of the antagonists and their produce look more comical than threatening, which does ruin some of the scenes' seriousness. In fact, two of the characters from this show are basically robots made to look like little girls, complete with rocket punch hands and "adorable" outfits. The main character even comments on the first villain's appearance, calling him an onion, though I thought he looked more like the most stereotypical mad professor to me. Even so, it's just great to see a show where a veritable badass take center stage and carry through. More so, because the body she obtained almost look like your average Barbie doll -- long, blonde hair, fairly curvy, princess attire and all -- but her expression never really loses that devil-may-care grin and redeyed, focused stare. It's definitely a sharp contrast from the generally sheltered, over-protected princess types you find in most fantasy fare, which, ironically, is exactly what Princess Alita used to be before the big swap. So, what can you expect from this show before its end? It does bring around a full resolution to everything. There are some good story elements and some bad ones, which I kind of expected -- it all balances out, I suppose. Of course, I never really had any particular expectations to this show, so one might say it turned out better than I expected. It also never really takes itself too seriously, unlike anther show I could mention, which I also reviewed just before this one. In the end, it's a fun show as long as you remember to shut off the logical parts of your brain. Just sit back and enjoy the asskicking and the general badassedry, and you'll be all good and entertained. Recommended Audience: As befits a show with a name like that, it does contain a good dose of violence, even gory. The Princess does, after all, live up to her name by getting her dress all speckled with blood every now and then. There's also a scene with very light sexual innuendo made early in the show, which I normally wouldn't have bothered even mentioning if not for the fact that I know some people take that kind of stuff far more seriously than explicit violence.